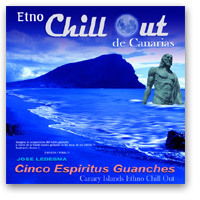 Because in Tenerife-South only THE BEST return over the sea! 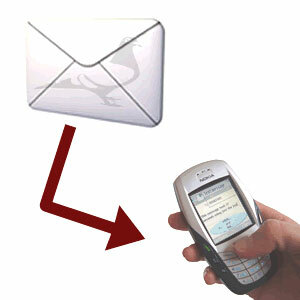 Do you want to received a SMS of your first arrivals? CONTACT US NOW WITH YOUR MOBILE PHONE NUMBER! Click to Download 2010 RACE Brochure! Click here for watch 3-PATHFINDER Tracking the Path in this race! Click here for watch 2nd race-day and Teide mountain in white! To Send your Fancier/Team Photograph and/or UPDATE Your Contact Information: Fill this form! "Click here to send you Photo/Contact info "
Urgent, fill this form in order to assign a name for each of you pigeons! 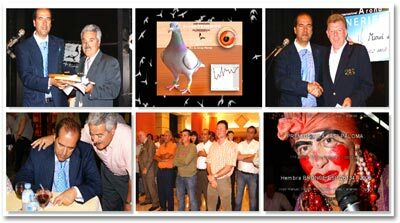 "Click here to go and fill the form to name pigeons"
"Click aqu� para ir al Formulario y poner nombre a mis pichones"
El Mayor SHOW COLOMB�FILO ONLINE de la Historia! �La Carrera de los 10 MILLONES DE PESETAS! �Elige tu forma de GANAR! �Select your path to win! 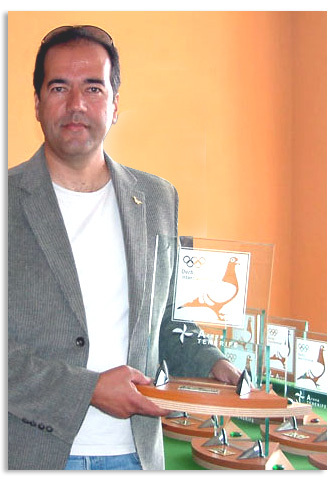 One reserve pigeon may be sent with every two entered pigeon. A team consists of three pigeons: one reserve and two entered pigeons. Belgium: Ivan Willockx-[Duivenkrant-La Vie Colombophile] - Email: duivenkrant@skynet.be Rozestraat 1 B-2860 Sint Katelijne Waver Belgium - Mobile Phone: +32 475 98 36 15 - Fax: +32 15 63 37 98 - Schitterende One Loft-Race in Tenerife: Vliegen over de zee ! 4de Derby International Arona-Tenerife 2009 Meer dan 30.000 euro aan prijzengeld! Grijp deze unieke opportuniteit om internationale faam te verwerven! 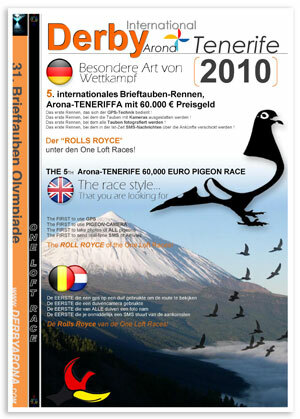 Derek Nicholls say: Race that is a nice little race and this one we will shipped mid June and I am sure this race will appeal to many UK guys because it is only 90 euros a bird and the birds don�t have to go till June when most people have birds off their top pigeons that are a bit to late for UK racing but ideal for the Tenerife race which is the following may (yearlings). This one will be ideal to visit with your better half for a holiday combined with a race. Many cheap package holidays from most UK airports can be found to go and see the main race in the Canary Islands late spring sunshine, I am sure this will be a big hit in this country. 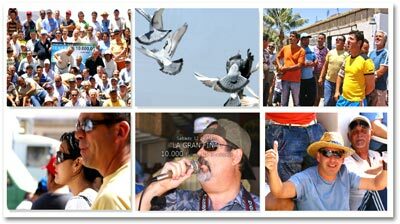 Holland: Ivan Willockx-[Duivenkrant-La Vie Colombophile] - Email: duivenkrant@skynet.be Mobile Phone: +32 475 98 36 15 - Fax: +32 15 63 37 98 - Schitterende One Loft-Race in Tenerife: Vliegen over de zee ! 4de Derby International Arona-Tenerife 2009 Meer dan 30.000 euro aan prijzengeld! Grijp deze unieke opportuniteit om internationale faam te verwerven! Volez au-dessus de la mer! 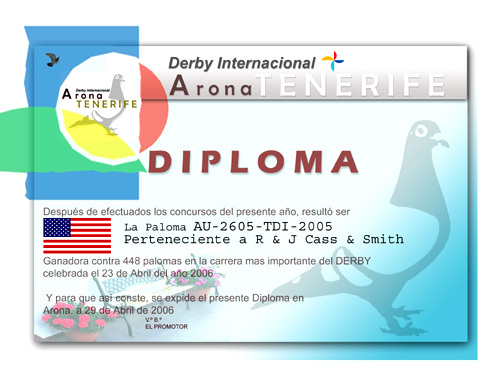 - 4de Derby International Arona-Tenerife 2009 - Plus de 30.000 euros de prix en argent! - Saisissez cette chance d'acqu�rir une r�putation internationale! - C'est le seul One Loft Race dont chaque pigeon poss�de sa photo sur Internet! - Vous pourrez suivre toutes les comp�titions, entra�nements et concours sur Internet. Vous serez tenu parfaitement au courant des prestations individuelles! -Une totale transparence! IIf you would like to participate in the greatest one loft race in the world today as a co-ordinator in your country, then please contact us on the above email address. If you would like to act as a Regional Agent/Collector in your country, please contact your Country Co-ordinator as listed above. �Le gusta la m�sica que oye en nuestra Web? 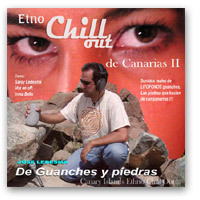 Una combinaci�n perfecta de tradiciones populares canarias, sonidos de nuestra tierra y nuestra gente, fusionados con una m�sica actual. 10 Temas musicales compuestos y producidos por Jos� Ledesma Batista, que le har�n revivir y so�ar el pasado. Pulse en estos discos para o�r algunos fragmentos y conocer mas acerca de este �nico, inigualable e irrepetible trabajo.